This article contains Glagolitic text. Without proper rendering support, you may see question marks, boxes, or other symbols instead of letters. The Glagolitic script (/ˌɡlæɡəˈlɪtɪk/, Ⰳⰾⰰⰳⱁⰾⰹⱌⰰ Glagolitsa) is the oldest known Slavic alphabet. It is generally agreed to have been created in the 9th century by Saint Cyril, a Byzantine monk from Thessaloniki. He and his brother, Saint Methodius, were sent by the Byzantine Emperor Michael III in 863 to Great Moravia to spread Christianity among the West Slavs in the area. The brothers decided to translate liturgical books into the Old Slavic language that was understandable to the general population, but as the words of that language could not be easily written by using either the Greek or Latin alphabets, Cyril decided to invent a new script, Glagolitic, which he based on the local dialect of the Slavic tribes from the Byzantine theme of Thessalonica. After the deaths of Cyril and Methodius, the Glagolitic alphabet ceased to be used in Moravia, but their students continued to propagate it in the First Bulgarian Empire, where it was subsequently also displaced by the Cyrillic alphabet. The Glagolitic alphabet was preserved only by the clergy of Croatia to write Church Slavonic until the early 19th century. The name was not created until many centuries after the script's creation, and comes from the Old Church Slavonic глаголъ glagol "utterance". The verb glagolati means "to speak". It has been conjectured that the name glagolitsa developed in Croatia around the 14th century and was derived from the word glagolity, applied to adherents of the liturgy in Slavonic. The Baška tablet, found in the 19th century on Krk, conventionally dated to about 1100. The first page of the Gospel of Mark from the 10th–11th century Codex Zographensis, found in the Zograf Monastery in 1843. The first page of the Gospel of John from the Codex Zographensis. In a book printed in 1591, Angelo Rocca attributed the Glagolitic script to Saint Jerome. The last Glagolitic entry in the baptismal register of the Omišalj parish on the island of Krk by the parishioner Nicholas in 1817. The creation of the characters is popularly attributed to Saints Cyril and Methodius, who may have created them to facilitate the introduction of Christianity. It is believed that the original letters were fitted to Macedonian dialects specifically. The number of letters in the original Glagolitic alphabet is not known, but it may have been close to its presumed Greek model. The 41 letters known today include letters for non-Greek sounds, which may have been added by Saint Cyril, as well as ligatures added in the 12th century under the influence of Cyrillic, as Glagolitic lost its dominance. In later centuries, the number of letters dropped dramatically, to fewer than 30 in modern Croatian and Czech recensions of the Church Slavic language. Twenty-four of the 41 original Glagolitic letters (see table below) probably derive from graphemes of the medieval cursive Greek small alphabet but have been given an ornamental design. The source of the other consonantal letters is unknown. If they were added by Cyril, it is likely that they were taken from an alphabet used for Christian scripture. It is frequently proposed that the letters sha Ⱎ, tsi Ⱌ, and cherv Ⱍ were taken from the letters shin ש and tsadi צ of the Hebrew alphabet, and that Ⰶ zhivete derives from Coptic janja Ϫ. However, Cubberley (1996) suggests that if a single prototype were presumed, the most likely source would be Armenian. Other proposals include the Samaritan alphabet, which Cyril learned during his journey to the Khazars in Cherson. 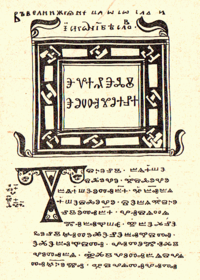 Glagolitic letters were also used as numbers, similarly to Cyrillic numerals. Unlike Cyrillic numerals, which inherited their numeric value from the corresponding Greek letter (see Greek numerals), Glagolitic letters were assigned values based on their native alphabetic order. The two monks later canonized as Saints Cyril and Methodius, brothers from Thessaloniki, were sent to Great Moravia in 862 by the Byzantine emperor at the request of Prince Rastislav, who wanted to weaken the dependence of his country on East Frankish priests. 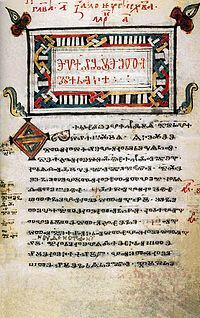 The Glagolitic alphabet, however it originated, was used between 863 and 885 for government and religious documents and books and at the Great Moravian Academy (Veľkomoravské učilište) founded by the missionaries, where their followers were educated. The Kiev Missal, found in the 19th century in Jerusalem, was dated to the 10th century. In 886 an East Frankish bishop of Nitra named Wiching banned the script and jailed 200 followers of Methodius, mostly students of the original academy. They were then dispersed or, according to some sources, sold as slaves by the Franks. Many of them (including Naum, Clement, Angelarious, Sava and Gorazd), however, reached Bulgaria and were commissioned by Boris I of Bulgaria to teach and instruct the future clergy of the state in the Slavic languages. After the adoption of Christianity in Bulgaria in 865, religious ceremonies and Divine Liturgy were conducted in Greek by clergy sent from the Byzantine Empire, using the Byzantine rite. 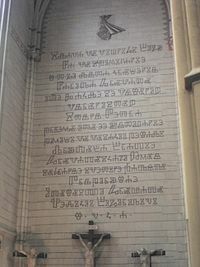 Fearing growing Byzantine influence and weakening of the state, Boris viewed the introduction of the Slavic alphabet and language into church use as a way to preserve the independence of the Bulgarian Empire from Byzantine Constantinople. As a result of Boris' measures, two academies, one in Ohrid and one in Preslav, were founded. From there, the students travelled to other places and spread the use of their alphabet. Some went to Croatia (Dalmatia), where the squared variant arose and where Glagolitic remained in use for a long time. In 1248, Pope Innocent IV granted the Croatians of southern Dalmatia the unique privilege of using their own language and this script in the Roman Rite liturgy. Formally granted to bishop Philip of Senj, permission to use the Glagolitic liturgy (the Roman Rite conducted in the Slavic language instead of Latin, not the Byzantine rite), actually extended to all Croatian lands, mostly along the Adriatic coast. The Holy See had several Glagolitic missals published in Rome. Authorization for the use of this language was extended to some other Slavic regions between 1886 and 1935. In missals, the Glagolitic script was eventually replaced with the Latin alphabet, but the use of the Slavic language in the Mass continued, until replaced by modern vernacular languages. Some students of the Ohrid academy went to Bohemia where the alphabet was used in the 10th and 11th centuries, along with other scripts. It is not clear whether the Glagolitic alphabet was used in the Duchy of Kopnik before the Wendish Crusade, but it was certainly used in Kievan Rus'. In Croatia, from the 12th century, Glagolitic inscriptions appeared mostly in littoral areas: Istria, Primorje, Kvarner, and Kvarner islands, notably Krk, Cres, and Lošinj; in Dalmatia, on the islands of Zadar, but there were also findings in inner Lika and Krbava, reaching to Kupa river, and even as far as Međimurje and Slovenia. The Hrvoje's Missal (Croatian: Hrvojev misal) from 1404 was written in Split, and it is considered one of the most beautiful Croatian Glagolitic books. The 1483 Missale Romanum Glagolitice was the first printed Croatian Glagolitic book. It was believed that Glagolitsa in Croatia was present only in those areas. But, in 1992, the discovery of Glagolitic inscriptions in churches along the Orljava river in Slavonia totally changed the picture (churches in Brodski Drenovac, Lovčić, and some others), showing that use of the Glagolitic alphabet was spread from Slavonia also. At the end of the 9th century, one of these students of Methodius – Naum, who had settled in Preslav, Bulgaria – created the Cyrillic script[dubious – discuss], which almost entirely replaced Glagolitic during the Middle Ages. The Cyrillic alphabet is derived from the Greek alphabet, with some letters (like ⟨ш⟩, ⟨ц⟩, ⟨ч⟩, ⟨ъ⟩, ⟨ь⟩, ⟨ѣ⟩) peculiar to Slavic languages being derived from the Hebrew alphabet. The decision[which? ][by whom?] in favor of Cyrillic created an alphabetical difference between the two literary centres of the Bulgarian state in Pliska and Ohrid. In the western part the Glagolitic alphabet remained dominant at first. However, subsequently in the next two centuries, mostly after the fall of the First Bulgarian Empire to the Byzantines, Glagolitic gradually ceased to be used there at all. Nevertheless, particular passages or words written with the Glagolitic alphabet appeared in Bulgarian Cyrillic manuscripts till the end of the 14th century. Sporadic instances aside, Glagolitic survived beyond the 12th century as a primary script in Croatia alone, although from there a brief attempt at reintroduction was made in the West Slavic area in the 14th century. The centre of influence appears to have been in the Kvarner Gulf, though the nature and extent of this influence remain subjects of debate. The early development of the Glagolitic minuscule script alongside the increasingly square majuscule is poorly documented, but before the advent of printing, a mutual relationship evolved between the two varieties; the majuscule being used primarily for inscriptions and higher liturgical uses, and the minuscule being applied to both religious and secular documents. Ignoring the problematic early Slavonian inscriptions, the use of the Glagolitic script at its peak before the Croatian-Ottoman wars corresponded roughly to the area that spoke the Chakavian dialect at the time, in addition to, to varying extents, the adjacent Kajkavian regions within the Zagreb bishopric. As a result, vernacular impact on the liturgical language and script largely stems from Chakavian sub-dialects. The first major threat to Croatian Glagolitic since it attained stability was from the Ottoman excursions, though the extent of cultural damage varied locally depending on the course of war. In the 17th century, though, the first successful direct attack on the script since the 12th century was headed by the Bishop of Zagreb, and after the Magnate conspiracy left the script without secular protectors, its use was limited to the littoral region. In the meantime, printing gradually overtook handwriting for liturgical manuscripts, resulting in a decline of the majuscule script, which was absorbed for titular and sometimes initial use within for minuscule documents. It was not until the late 18th century and the onset of modernity that Glagolitic received significant further threats, and through western influence, especially secular, Glagolitic culture collapsed, so that by the mid 19th century, the script was purely liturgical, relying mostly on printed materials. By the time of the devastating Italianization movements under Fascist Italy in the early 20th century, numerous independent events had already greatly reduced the area of the liturgical use of Glagolitic. The tradition that the alphabet was designed by Saint Cyril and Saint Methodius has not been universally accepted. A less common belief, contradicting allochthonic Slovene origin, was that the Glagolitic was created or used in the 4th century by St. Jerome (Latin: Eusebius Sophronius Hieronymus), hence the alphabet is sometimes named Hieronymian. It is also acrophonically called azbuki from the names of its first two letters in Bulgaria, on the same model as "alpha" + "beta". The Slavs of Great Moravia (present-day Slovakia and Moravia), Hungary, Slovenia and Slavonia were called Slověne at that time, which gives rise to the name Slovenish for the alphabet. Some other, rarer, names for this alphabet are Bukvitsa (from common Slavic word "bukva" meaning "letter", and a suffix "-itsa") and Illyrian. In the Middle Ages, Glagolitsa was also known as "St. Jerome's script" due to popular mediaeval legend (created by Croatian scribes in the 13th century) ascribing its invention to St. Jerome (342–429). That claim, however, has been resolutely[clarification needed] disproven. Until the end of the 18th century, a strange but widespread opinion dominated that the Glagolitic writing system, which was in use in Dalmatia and Istria along with neighboring islands, including the translation of the Holy Scripture, owe their existence to the famous church father St. Jerome. Knowing him as the author of the Latin Vulgate, considering him – by his own words, born on the border between Dalmatia and Pannonia (remembering that the Dalmatian borders extended well into Istria at that time) – presumed to be an Illyrian, the self-styled Slavic intellectuals in Dalmatia very early began to ascribe to him the invention of glagolitsa, possibly with the intention of more successfully defending both Slavic writing and the Slavic holy service against prosecutions and prohibitions from Rome's hierarchy, thus using the opinion of the famous Latin Father of the Church to protect their church rituals which were inherited from the Greeks Cyril and Methodius. We do not know who was the first to put in motion this unscientifically-based tradition about Jerome's authorship of the Glagolitic script and translation of the Holy Scripture, but in 1248 this version came to the knowledge of Pope Innocent IV. <...> The belief in Jerome as an inventor of the Glagolitic lasted many centuries, not only in his homeland, i.e. in Dalmatia and Croatia, not only in Rome, due to Slavs living there... but also in the West. In the 14th century, Croatian monks brought the legend to the Czechs, and even the Emperor Charles IV believed them. The epoch of traditional attribution of the script to Jerome ended probably in 1812. In modern times, only certain marginal authors share this view, usually "re-discovering" one of the already-known mediaeval sources. A hypothetical pre-Glagolitic writing system is typically referred to as cherty i rezy (strokes and incisions) – but no material evidence of the existence of any pre-Glagolitic Slavic writing system has been found, except for a few brief and vague references in old chronicles and "lives of the saints". All artifacts presented as evidence of pre-Glagolitic Slavic inscriptions have later been identified as texts in known scripts and in known non-Slavic languages, or as fakes. The well-known Chernorizets Hrabar's strokes and incisions are usually considered to be a reference to a kind of property mark or alternatively fortune-telling signs. Some "Ruthenian letters" found in one version of St. Cyril's life are explainable as misspelled "Syrian letters" (in Slavic, the roots are very similar: rus- vs. sur- or syr-), etc. The values of many of the letters are thought to have been displaced under Cyrillic influence or to have become confused through the early spread to different dialects so the original values are not always clear. For instance, the letter yu Ⱓ is thought to have perhaps originally had the sound /u/ but was displaced by the adoption of an oѵ ligature Ⱆ under the influence of later Cyrillic. Other letters were late creations after a Cyrillic model. The following table lists each letter in its modern order, showing an image of the letter (round variant), the corresponding modern Cyrillic letter, the approximate sound transcribed with the IPA, the name, and suggestions for its origin. Several letters have no modern counterpart. Note that yery (ⰟⰉ) is a digraph of either yer (Ⱏ) or yerь (Ⱐ), followed by either izhe (Ⰹ, Ⰺ) or i (Ⰻ). In older texts, uk (Ⱆ) and three out of four yuses (Ⱗ, Ⱘ, Ⱙ) also can be written as digraphs, in two separate parts. The order of izhe (Ⰹ, Ⰺ) and i (Ⰻ) varies from source to source, as does the order of the various forms of yus (Ⱔ, Ⱗ, Ⱘ, Ⱙ). Correspondence between Glagolitic izhe (Ⰹ, Ⰺ) and i (Ⰻ) with Cyrillic И and І is unknown. Proto-Slavic language did not have the letter F, and the letter Fita (Ⱚ) was used for transcribing words of Greek origin at first, later for native Slavic words once the phoneme [f] developed. The Glagolitic alphabet was added to the Unicode Standard in March 2005 with the release of version 4.1. The Unicode block for Glagolitic is U+2C00–U+2C5F. Glagolitic script is the writing system used in the world of The Witcher video game series. It is also featured, in various uses, in several of the point and click adventure games made by Cateia Games, a Croatian game studio. Wikimedia Commons has media related to Glagolitic alphabet. ^ "Glagolitic". Dictionary.com Unabridged. Random House. ^ Bernard Comrie and Greville G. Corbett, The Slavonic Languages, Taylor & Francis, 2002, p. 29. ^ Fučić, Branko (21 September 1971). "Najstariji glagoljski natpisi" [Oldest Glagolitic Inscriptions]. Slovo (in Croatian). 21: 227–254. ^ Alan Timberlake, A Reference Grammar of Russian, Cambridge University Press, 2004, p. 14: "In order to write in Slavic they devised a new alphabet which is now called Glagolitic." ^ a b Florin Curta & Paul Stephenson, Southeastern Europe in the Middle Ages, 500–1250, Cambridge University Press, 2006, p. 214: "At the emperor’s request, Constantine and his brother started the translation of religious texts into Old Church Slavonic, a literary language most likely based on the Macedonian dialect allegedly used in the hinterland of their home-town, Thessalonica. 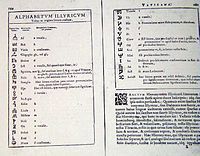 Constantine devised a new alphabet, later called Glagolitic, to render the sounds of the new language and to adapt it to the new conditions iii Moravia. The two brothers seem to have initially translated only texts for religious instruction, such as the excerpts from the Gospels that were used in liturgy." ^ Simon Franklin, Writing, Society and Culture in Early Rus, c. 950–1300, Cambridge University Press, 2002, p. 93: "East Christian Slays used two alphabets, Glagolitic and Cyrillic. Just to confuse matters, the script devised by Cyril was probably Glagolitic, while Cyrillic—which came to predominate, emerged somewhat later." ^ Jean W. Sedlar, East Central Europe in the Middle Ages, 1000-1500, University of Washington Press, 1994, p. 114: "Indeed, when a Slavic ruler named Rastislav in the year 863 invited the Byzantine emperor to send him a Christian bishop, the emperor was more than willing. He commissioned two eminent Greeks of Salonika. Constantine (better known by his monastic name of Cyril) and his brother Methodius, to develop a written language for the use of the Slavic peoples. These two apostles (who were later canonized as saints) were not the first to translate religious writings into Slavic, since some preliminary work had been done earlier by Bavarian missionaries. However, they were the first to invent a Slavic alphabet and undertake translations into Slavic on a major scale." ^ Paul Cubberley (1996) "The Slavic Alphabets". In Daniels and Bright, eds. The World's Writing Systems. Oxford University Press. ISBN 0-19-507993-0. ^ Daniels, Peter T.; Bright, William, eds. (1996). The World's Writing Systems. Oxford University Press, Inc. p. 347. ISBN 978-0195079937. ^ "The right to use the Glagolitic language at Mass with the Roman Rite has prevailed for many centuries in all the south-western Balkan countries, and has been sanctioned by long practice and by many popes..." Dalmatia, Catholic Encyclopedia; "In 1886 it arrived to the Principality of Montenegro, followed by the Kingdom of Serbia in 1914, and the Republic of Czechoslovakia in 1920, but only for feast days of the main patron saints. The 1935 concordat with the Kingdom of Yugoslavia anticipated the introduction of the Slavic liturgy for all Croatian regions and throughout the entire state..." The Croatian Glagolitic Heritage, Marko Japundzić. ^ (in Croatian) "Glagoljaška baština u Slavonskom Kobašu", Slavonskobrodska televizija, News from February 25, 2007. ^ Sedlar, Jean W. (1994). East Central Europe in the Middle Ages, 1000–1500. University of Washington Press. p. 146. ISBN 9780295972916. Retrieved 2013-05-01. ^ Велчева, Б. Късната българска глаголица. Кирило-Методиевски студии, кн. 12, София, 1999, 87–152. ^ Strohal, Rudolf (1915). Hrvatska glagolska knjiga [Croatian Glagolitic Book] (in Croatian). Zagreb: Merkur. ^ P. Solarić's "Букварь славенскiй трiазбучный" (Three-alphabet Slavic Primer), Venice, 1812 mentions the version as a fact of science (see Jagić 1911, p. 52; Vajs 1932, p. 23). ^ For example, K. Šegvić in Nastavni vjesnik, XXXIX, sv. 9-10, 1931, refers to a work of Rabanus Maurus. (see Vajs 1932, p. 23). ^ L. Niederle, "Slovanské starožitnosti" (Slavic antiquities), III 2, 735; citation can be found in Vajs 1932, p. 4. ^ a b c d e f g h i j k l m n o p q r s t u v w x y z aa ab ac ad ae af ag ah ai aj ak al Schenker, Alexander M. (1995). "Early Writing". The dawn of Slavic: an introduction to Slavic philology. New Haven and London: Yale University Press. pp. 168–172. ISBN 978-0-300-05846-8. ^ "Wiedźmiński alfabet - o czym informują nas plakaty w grze Wiedźmin 3: Dziki Gon?". www.grynieznane.pl. Retrieved 2018-08-26. Fučić, Branko: Glagoljski natpisi. Croatian Academy of Sciences and Arts, Zagreb 1982. Fullerton, Sharon Golke: Paleographic Methods Used in Dating Cyrillic and Glagolitic Manuscripts. Ohio State University, Columbus 1971. Jagić, Vatroslav: Gramatika jezika hèrvatskoga. A. Jakić, Zagreb 1864. Japundžić, Marko: Hrvatska glagoljica. Hrvatska uzdanica, Zagreb 1998. Japundžić, Marko: Tragom hrvatskog glagolizma. Kršćanska sadašnjost, Zagreb 1995. Vajs, Josef: Abecedarium palaeoslovenicum in usum glagolitarum. Staroslavenska akademija, Krk 1917. Vajs, Josef: Rukověť hlaholské paleografie. Orbis, Prague 1932. Wikisource has the text of the 1920 Encyclopedia Americana article Glagolitic Alphabet. Glagolitic alphabet. Alternative encoding. – Proposals. This page was last edited on 13 April 2019, at 12:06 (UTC).